After an incredible opening NASCAR weekend, not even a rain delay could dampen the excitement this man brought with his victory. Sometimes there are just moments where it is great to be a race fan. I have seen so much in all my years of being both a fan and a writer for this sport, but even now there is nothing quite like the opening race of the season. No other sport, whether it’s using a ball, a puck or in some cases a pair of running shoes, holds their biggest event right at the start of the year. The Daytona 500 means so much to everyone because it’s the culmination of two weeks of on-track activities and also two months of off-track preparations. A win in this race defines careers, and sometimes completes them. “The King” Richard Petty won seven of these prestigious races, with each meaning more than the last. Some drivers have only tasted this win once in their careers, but that one win puts a final stamp on accomplishing what is most coveted in the sport. 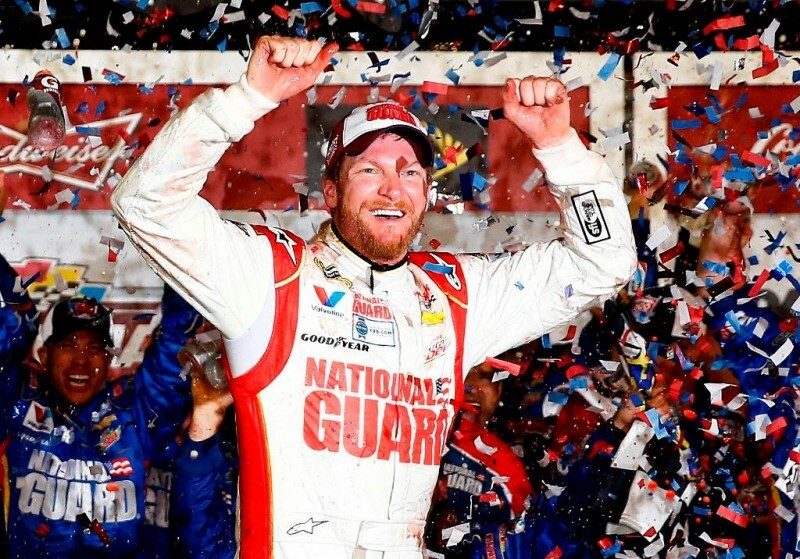 It took Dale Earnhardt 20 years to take a win in the Daytona 500. At that point in his career, he already tied Petty in championships, and maybe was in the latter stages of his career, but was still capable of winning races. However, he would keep being razzed on by his competition for not getting that one win, that one victory where the eyes of everyone were watching. In 1998, everyone watched when every crew member stood on pit lane to give him congrats, and see that car go to victory lane. When he died in 2001, NASCAR lost something, because that moment despite being etched in history, is also a reminder that this race has a dark side. In 2004, his young son would make his fifth start in the race, and all the eyes of the world were watching as the car he drove for his dad would hold off a charging Tony Stewart to get his first win in the biggest event of the season. This weekend, Dale Earnhardt Jr. was not exactly the #1 guy on the list of favorites, but he was up there. Something about Daytona and the Earnhardt name is magical. In 2002, when Junior drove the Nationwide race with his dad’s number on the side, it went to victory lane. In 2010, the debut race for the newer Nationwide car, he drove to victory lane again, wearing the No. 3 on the side. This race marked the first time in Cup competition that the No. 3 would return to racing at that level since the 2001 Daytona 500, this time with Austin Dillon driving. It may not be the Earnhardt name, but the son of the “Intimidator” gave it the blessing to run. In a way, that blessing brought closure to Junior, because in a way he always knew in time the number would return, and the magic would still be there. This time, the magic went from his dad’s number into his hands, because no caution laps nor a six-plus hour rain delay stopped him from tasting victory once again in the Daytona 500. Simply put, there is nothing like this race. It defines careers, and changes lives. In 2011, Trevor Bayne took the most improbable, and highly decorated, win of his entire life in this race. In 2002, an unexpected win came from Ward Burton. There have been fights after this race (1979), wrecks coming to the line between the lead cars (1976), and even the first race took three days to determine a winner. The Daytona 500 is the crown jewel of NASCAR. The only time a driver smiles bigger is when they win the season championship. Aside from that, of all the 36 races on the year, this race is the one that matters most. “The Great American Race” is one of a kind, never to be duplicated. CAUTIONS: 7 for 39 laps. Lap 24-26 (#42 spin-T2), 33-46 (Fluid on Track from #78/Weather [Red Flag-6 Hrs, 21 Mins, 40 Secs. ]), 146-153 (#10, 30, 27, 66, 43, 38, 3, 33, 5, 9, 51, 98, 4 accident-FS), 163-168 (#42, 5, 9, 7, 55, 3, 13, 1, 31, 33 accident-T4), 185-187 (#21 accident-BS), 195-198 (#51, 33, 30, 32, 26, 3, 31 accident-T3), 200-200 (#36, 99, 47, 18, 1, 4 accident-FS). LEAD CHANGES: 42 among 18 drivers. Dillon 1, Hamlin 2-10, Kurt Busch 11-25, Menard 26-30, Hamlin 31, Kyle Busch 32-45, Kahne 46, Kyle Busch 47, Kahne 48, Kyle Busch 49, Hamlin 50-55, Kyle Busch 56, Keselowski 57, Kyle Busch 58-59, Keselowski 60-63, Menard 64-70, Logano 71-72, Keselowski 73-75, Bayne 76-77, Almirola 78-82, Allmendinger 83, Allgaier 84, Patrick 85-86, Allgaier 87, Waltrip 88-89, Menard 90-106, Johnson 107-115, Keselowski 116-120, Johnson 121-126, Allgaier 127-128, Waltrip 129-130, Earnhardt Jr. 131-143, Edwards 144, Earnhardt Jr. 145-150, Biffle 151-153, Earnhardt Jr. 154-155, Biffle 156-158, Earnhardt Jr. 159-172, Biffle 173-174, Edwards 175-177, Earnhardt Jr. 178, Edwards 179-182, Earnhardt Jr. 183-200. TIME OF RACE: 3 Hrs, 26 Mins, 29 Secs. POINT STANDINGS: 1. Earnhardt Jr, 48; 2. Hamlin, -5; 3. Keselowski, -6; 4. Gordon, -8; 5. Johnson, -8; 6. Kenseth, -10; 7. Stenhouse Jr, -11; 8. Biffle, -11; 9. Dillon, -12, 10. Mears, -14.